Metro Mobile Tray Racks come in a variety of finishes and sizes. 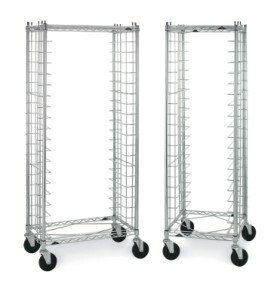 From utility carts to taller carts, there is a size to fit your needs. Economical solution for storage and transport of trays. Side-load models are highly space efficient. Choice of 1 1/2″ (38mm) or 3″ (76mm) (20 pans) spacing. Rolls easily on 5″ (127mm) swivel casters. Durable Super Erecta Brite™ finish. The 1/2″ (12.7mm) food grade polyethylene cutting board/work surface provides an area for slicing, mixing, garnishing or other types of food preparation. Choice of 1 1/2" (38mm) or 3" (76mm) (20 pans) spacing. Rolls easily on 5" (127mm) swivel casters. The 1/2" (12.7mm) food grade polyethylene cutting board/work surface provides an area for slicing, mixing, garnishing or other types of food preparation.